Photgraphing North Wales is a comprehensive photo-location guidebook including: Snowdonia National Park, the Isle of Anglesey, the North Wales Coast, Llyn Peninsula, Llangollen and the North East. Author and local North Wales photographer Simon Kitchin describes over 100 locations and several hundred viewpoints for the reader to visit. Each location chapter starts with an overview describing historical, literary, geological, and natural history features including the photographic potential of a location. Suggested photographic viewpoints are described at each location along with advice on how to take the best photographs whilst there. It is lavishly illustrated with over 300 high quality colour photographs of North Wales landscapes. 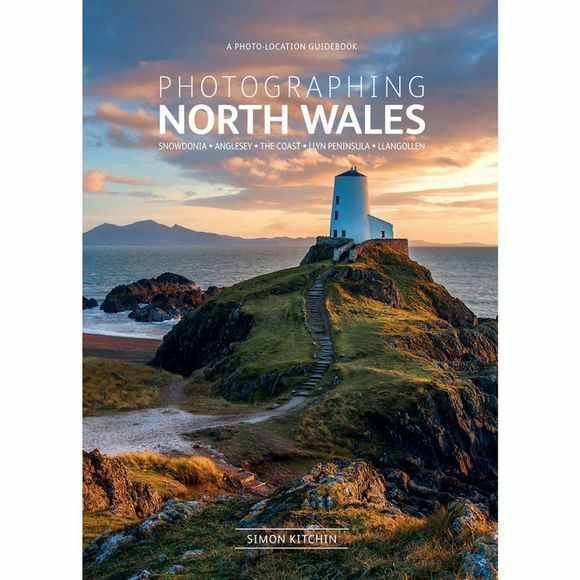 This guidebook will appeal to both keen photographers and anybody with a camera who visits North Wales. The locations include big landscapes and panoramas; lighthouses; beaches; mountains; villages; castles and abbeys; churches; waterfalls; lakes; wildlife; slate quarries; heritage steam railways; industrial heritage; military aircraft; shows and events; gardens; historic houses; seaside resorts. OS style maps are used throughout, along with lat-long co-ordinates, map co-ordinates and postal codes for each location. Access information includes whether a location is accessible by wheelchair. The introduction to the book includes chapters on seasonal highlights, best times to visit, how to get around the North Wales and the weather. On the front flap of the book there are a sun compass and sun elevation graphic, and sunset/sunrise times throughout the year.